Counter to the national trend, several housing markets saw foreclosure starts rise year over year last month, according to a new report from ATTOM Data Solutions, a real estate data firm. Forty-three percent of local markets saw an annual increase in May in foreclosure starts. Foreclosure starts were most on the rise in Houston, which saw a 153 percent jump from a year ago. Hurricane Harvey struck the Houston metro area in August 2017, tying with Hurricane Katrina as the costliest tropical cyclone on record, and has contributed to many recent foreclosures in the area. Other areas that are seeing foreclosure starts rise: Dallas-Fort Worth (up 46% year over year); Los Angeles (up 14 percent); Atlanta (up 7 percent); and Miami (up 4 percent). A total of 33,623 U.S. properties started the foreclosure process in May, which is down 6 percent from a year ago. But a number of states—23 states and the District of Columbia—posted a year-over-year increase in foreclosure starts in May. 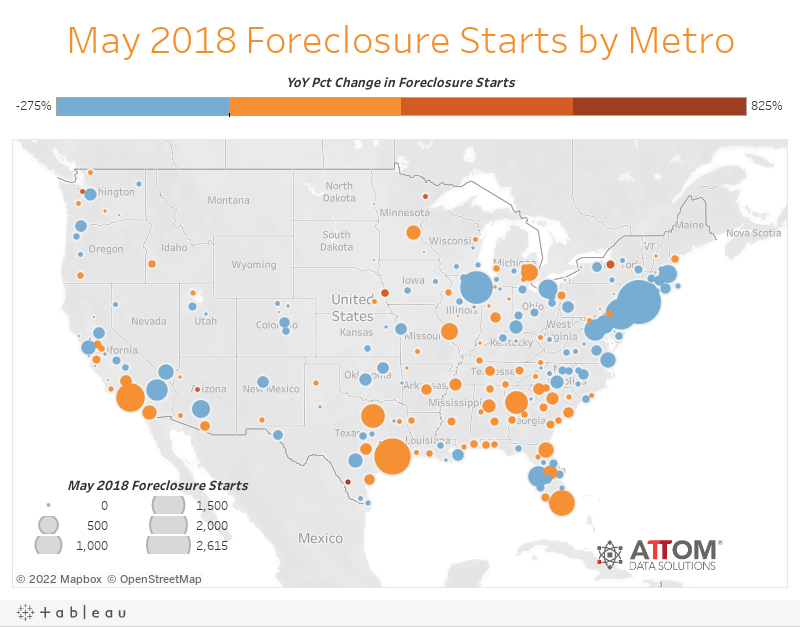 Overall, the metro areas with the highest foreclosure rates in May were: Flint, Mich.; Atlantic City, N.J.; Trenton, N.J.; Philadelphia; and Columbia, S.C.
View the chart below to see foreclosure starts by metro area. This entry was posted in Housing Market, Real Estate and tagged foreclosure on July 6, 2018 by Bone Fish.